While I am planning to just give my books away to friends, family,and charitable causes, my new marketing book says, "Resist the temptation to send books to your friends and family. Send to book reviewers, some producers and key bookstore buyers, instead." Hmm, I'm drawing a blank here. I don't know any reviewers, producers or key bookstore buyers. Well, I know some, but I'm uncomfortable thrusting my book upon them in a such an obvious "make people buy my book" way. And I guess that is my issue with promotion and marketing. The naive part of me wants to believe that if my book is good enough, it'll find its audience and sell well on its own. But the reality is that no one will buy your book if they don't hear about it and it's not the best books that do well, it's the ones that "yell" the loudest. And I care too much about my books to let them slip into the out-of-print graveyard without a good war-cry. So while I have not exactly embraced marketing, I have decided that we must at least hold hands. 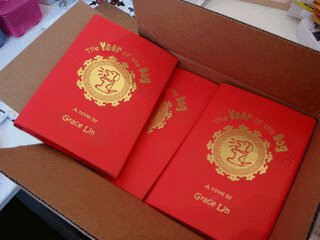 With the help (and prodding)of my sister, I've contacted groups and set up events in Seattle, Portland, and possibly San Diego and Arizona to try to push "Year of the Dog." I've sent out some postcards to friends and colleagues (and key bookstore buyers as suggested). I've written an article on why I wrote the book and offered it to publications. To me, this is marketing at full force--going full throttle into battle. But, a brief perusal through marketing resources show me that my attack is not even a mere fistfight. It seems like if you really want to wrestle, you have to promote with every breath, view every conversation as an opportunity to sell. One resource sites an example of a woman who sold her book to every passenger on her airplane flight. The author wrote this in tones of admiration, but I was horrified. How obnoxious is it to have goods forced upon you when you can't even leave? I want my books to do well, I want to promote them so they get the attention I feel they deserve. But I don't want to transform the labor of my work to boorish behavior. It's literature, not rock music. But perhaps that's what my problem is and why I am not as successful as I could be. And really, I have no right to be condescending. Because, even though there is line between being a rat in the rat race and a mouse trying to find your way through the maze, you're still a rodent through and through.